This morning it was reported that there would be 121,000 travelers through the local international airport today. That kind of news makes me even more grateful for the early Christmas trip we took closer to the beginning of this month: a fun and relaxing trip to visit my husband’s family on the West Coast of Canada. It was a treat for us to sleep in (once we’d all adjusted to the new time zone! ), explore the beach, nap, and catch up with family. It was also a great time for Jasper to have lots of time with both parents, to connect with his extended family, and to spread his wings a bit. By the end of the trip, he was feeding Grandma’s cat completely independently, he was confidently carrying a step-ladder around the kitchen, he’d help make a lovely batch of blueberry pancakes, and he had happily adapted to a new washroom routine — carrying a little step-stool from the toilet to the sink for hand-washing, and back again. 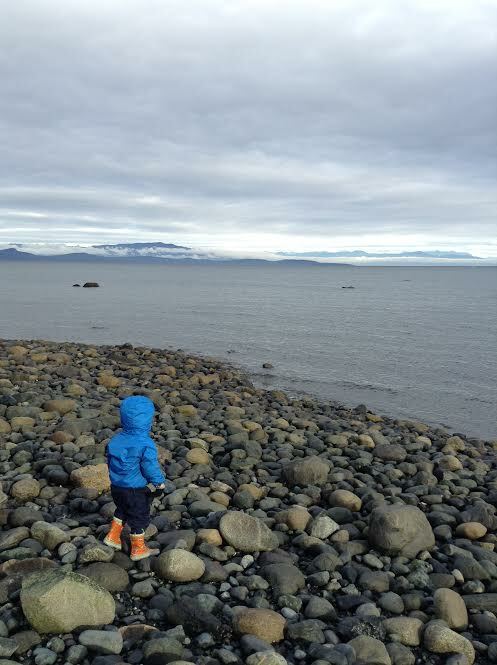 But it wasn’t just Grandma and Grandpa’s home environment that gave these opportunities for independence — actually getting to our West Coast destination and back, were huge learning and growing experiences for Jasper. Despite early mornings, strange rules (have you ever had to go through airport security with a toddler?) and somewhat stressed parents, Jasper loved traveling. After our trip in August, I was once again pretty well prepared, with our backpack stocked with hands-on activities, many of which I wrote about earlier or can be found with a quick Pinterest search: stickers, books, etch-a-sketch, etc. Though we made use of many of things I’d packed, Jasper also enjoyed watching the screen on the back of the seat, opening and closing the window shade, and making friends with folks around us. This time around Jasper had his own seat, which made a lot of things simpler (including mama’s feeling of personal space and the addition of another baggage allowance). It also meant getting to operate his own seatbelt — similar to the ones the grown ups use in our car. No activity or treat or surprise I packed came close to comparing to the amount of time spent enjoying his seat belt. The other awesome, can’t-leave-home-without-it tool in the arsenal was the suitcase. 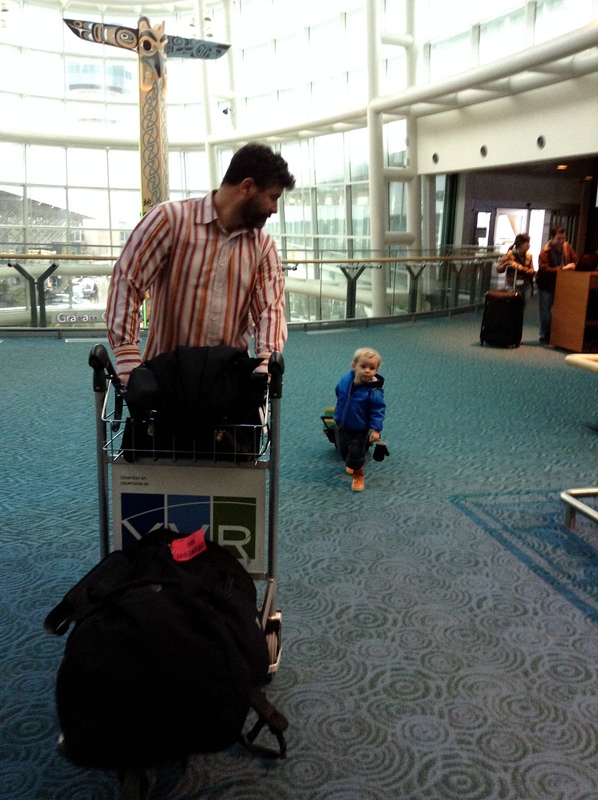 From the moment we arrived at the airport for departure, Jasper was in charge of his own kid-sized, rolling suitcase. We were including it in our carry-on baggage, and so he wheeled that little Franklin “oot-tase” all the way to the plane completely independently (something that probably couldn’t happen with a cute, ride-on Trunki suitcase). He was over the moon, and we didn’t have another bag to carry. Win-win. We saw a few other kids pulling their own suitcases, and they all had the same look of pride and determination. It’s Halloween day, which I’m trying to convince myself does NOT signal the end of autumn, and the start of…that other season. With warnings of wet flurries tonight, it’s been a real challenge. I thought I’d round up some of the apple and harvest-themed work we’ve been up to over the past month or so, before it’s too late. Apples are a wonderful cold-storage fruit too, so the fun with local apples can continue all winter long. We are really blessed to live in a bit of an apple belt (there’s a local stretch of country roads labelled as “The Apple Route” if themed road trips are your thing), and there are a number of orchards around that are available for picking-your-own. This was our second year going, and it’s becoming a really sweet tradition. 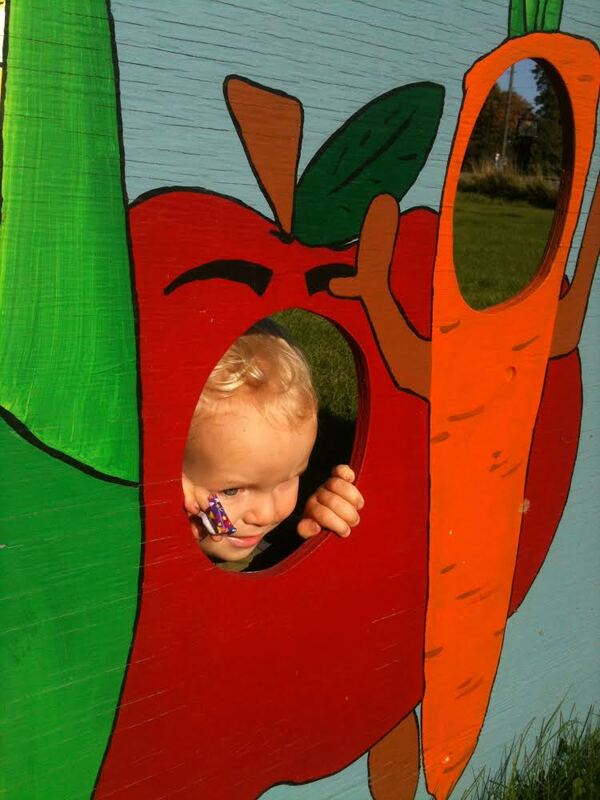 It really helps to set the scene early in the season, so that J can grasp where these apples are coming from. 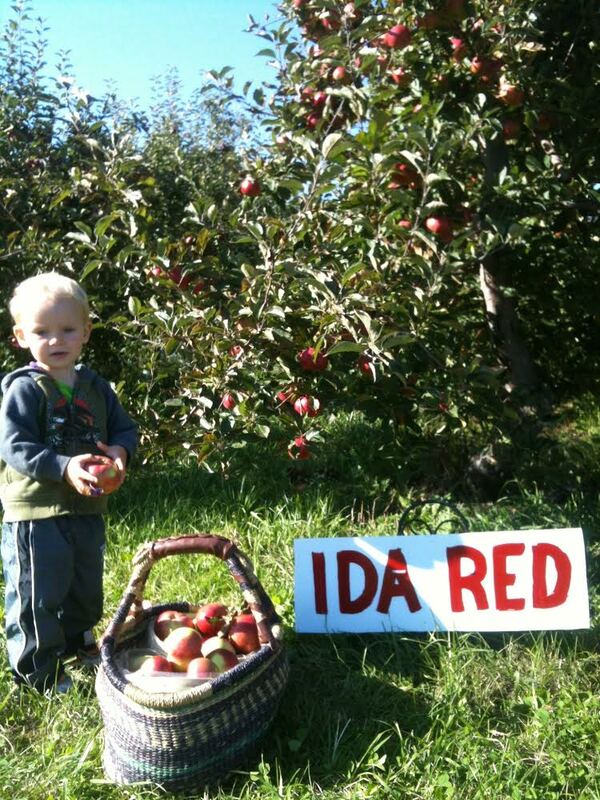 It’s also an affordable way of stocking up for all the apple fun to come. Plus, apples grow really low. Like, toddler height, for instance. 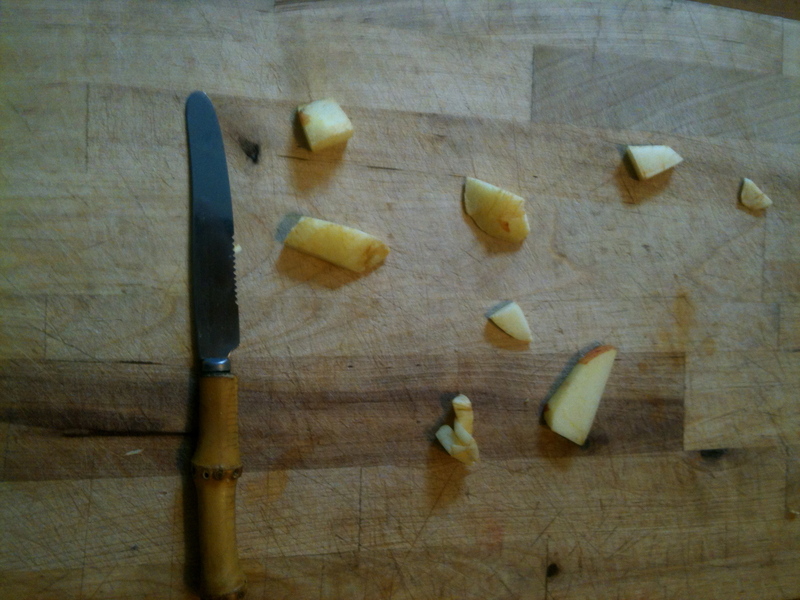 We were given an apple peeler last Christmas by an old friend and it has turned out to be one of our most-loved gifts. 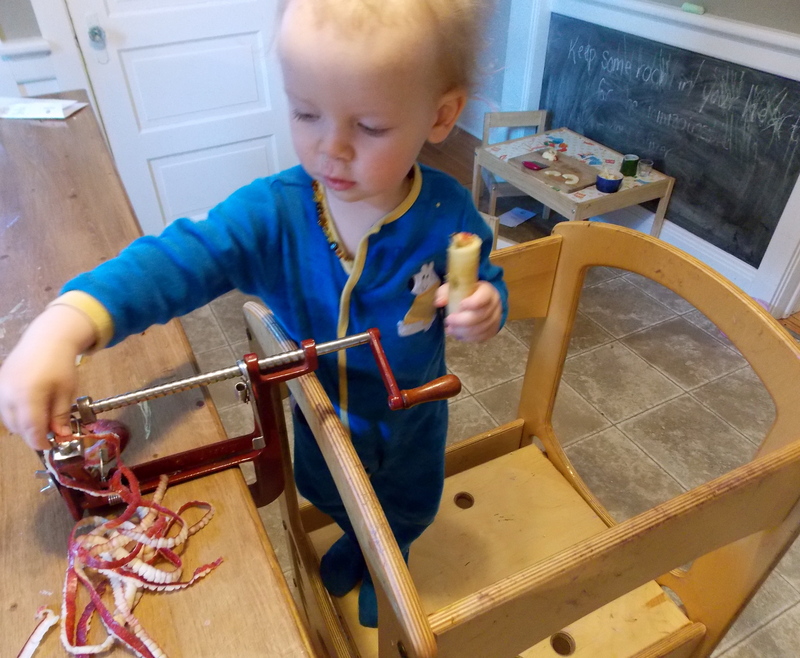 Jasper is becoming more and more adept at turning the crank, but even as a younger toddler, we’d do it hand-over-hand and he loved to watch the apple turn. He loves to eat the ribbons of apple peel that twist off of the peeler. I can see this becoming an independent work within a year or so. Our apple peeler also slices the apple into a spiral, which is a great set up for the next work: cutting with a knife and cutting board. 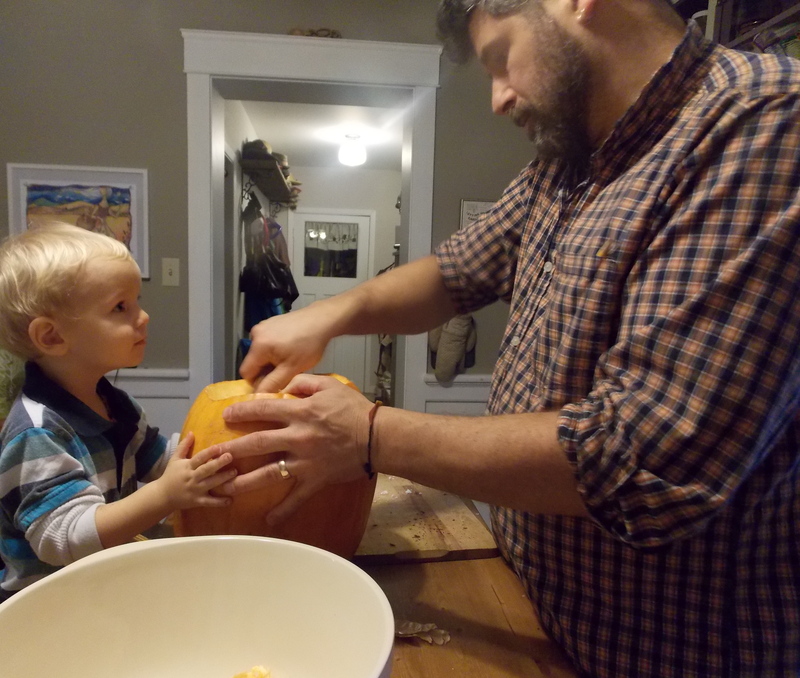 When he was younger, we usually used the wavy chopper from Montessori Services, and he’s since moved onto using a small, slightly serrated knife (which is meant to be a cheese knife. Have we talked about cheese knives? They’re toddler-hand-sized and depending on the knife, perfect for either cutting or spreading. Get thee to a thrift store!). Jasper has been loving painting these days — at almost any time of the day. Case in point: today he painted before breakfast. Having the paint and paper available on the art shelf at all times has been really allowing him to pursue this love. 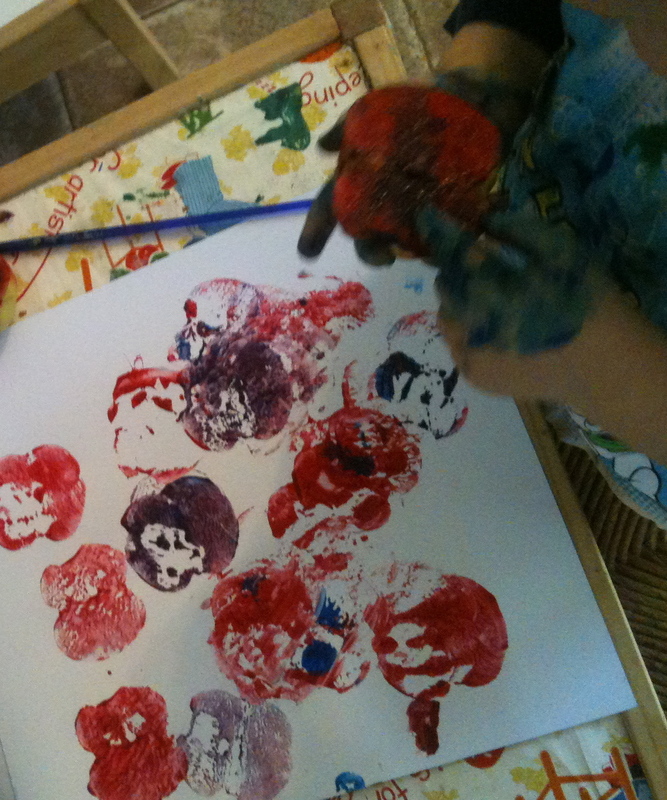 A few days ago, we did some apple stamping. Slice an apple in half (in this case, an apple I found on the counter with two small, browning bites out of it), paint the inside, slam it down. Actually, J eventually found that slamming doesn’t actually transfer paint very well. 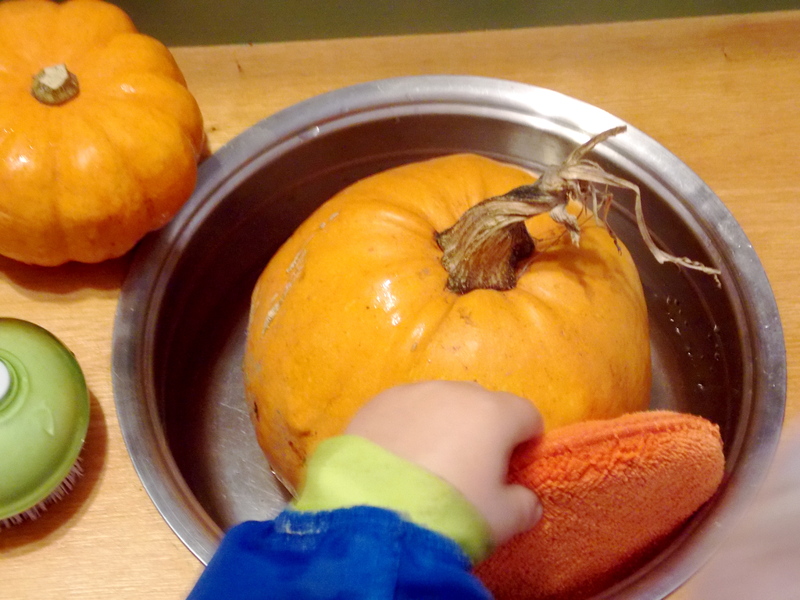 This is a variation on the watermelon exploration we did in the summer — carrying, measuring and washing a pumpkin. And hey, sometimes those pumpkins can be a bit muddy straight out the patch, so this practical life work can be really practical. Keep your fingers crossed for warm weather for wee trick-or-treaters tonight! Happy Halloween! P.S. What are your plans for keeping November from getting too wintery? For the minimalists, the budget-savvy, the purists: this is the Montessori work for you. This isn’t meant to be a “how-to” recipe to follow — just an example of how an afternoon can be filled with slow and simple experiments and exploration. Simple exploration of the world is an important part of Montessori practice for very young children, and you can do it any time, with any thing, with no cash outlay at all. 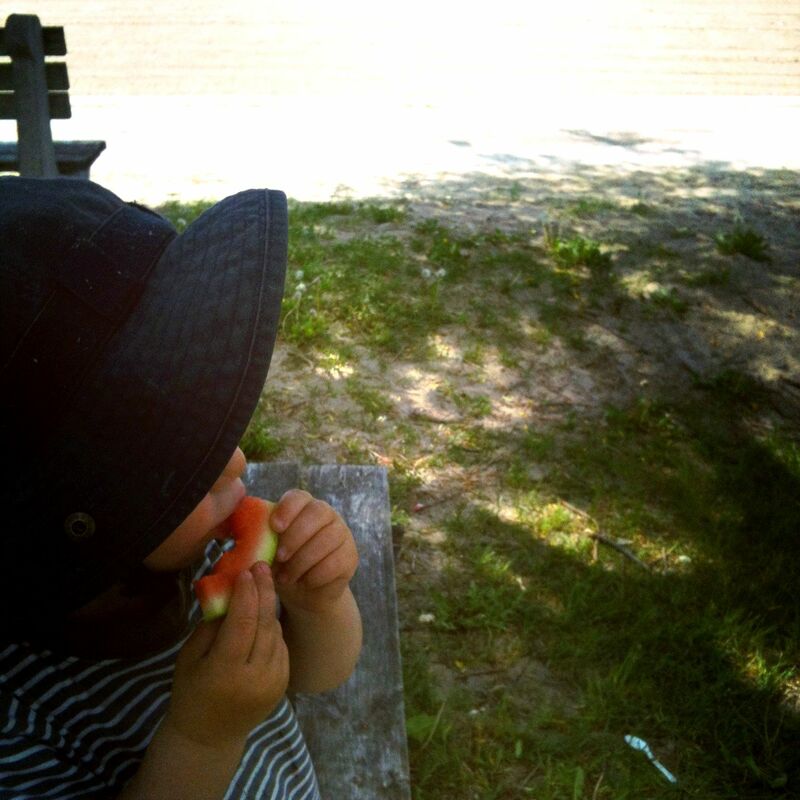 Nothing says summer like watermelon, and nobody loves watermelon more than a toddler, which lead us to an afternoon spent with a watermelon. Washing! First, we carried the watermelon up the stairs, into the house, onto the Learning Tower and up into the sink. 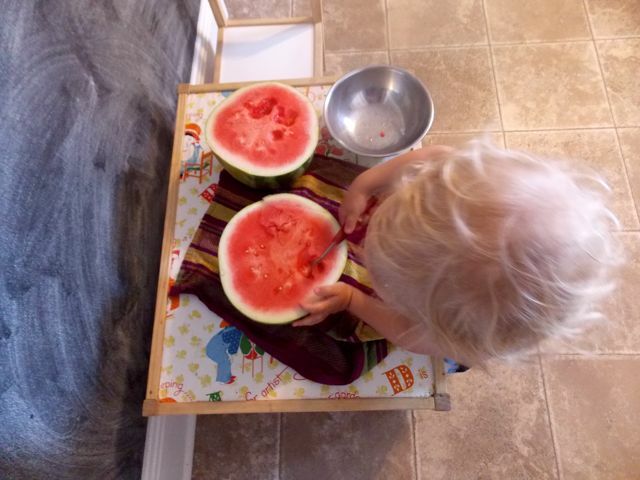 Actually, first we carried it to his toddler-sized kitchen sink, but the watermelon was too big, so we washed it in the adult-sized kitchen sink — exploration and experimentation! We took turns walking slowly and holding the watermelon with both hands. Next time, I might get a slightly smaller and lighter watermelon that Jasper could more easily carry. Drying! Then we carried the wet watermelon over to his table (because toddlers are in the sensitive period for movement, it’s important to give them lots of opportunities to move — something that occasionally runs counter to our adult tendency to set everything up for convenience and fewer steps). Then Jasper dried the watermelon with a towel. We looked at the water droplets and he tried to get each water drop onto the towel, one by one. Slicing! Then I brought the knife and the cutting board over, and cut most of the way through the watermelon, so that it was still whole, just with a slice through. Jasper pulled the water melon halves apart and we spent some time putting them back together and taking them apart again. One part. Two parts. Spooning! 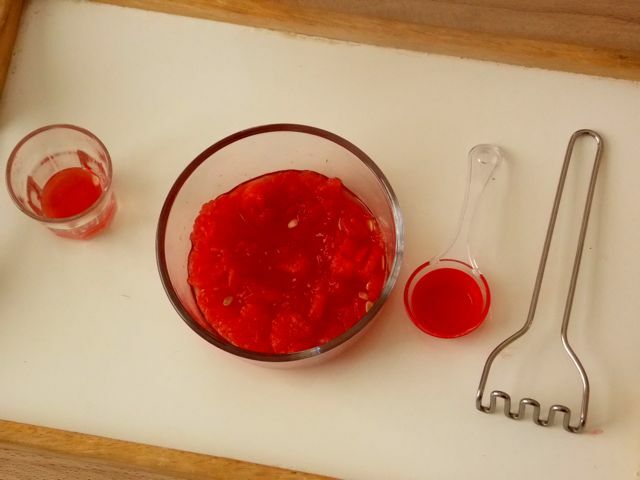 We then each had a half a watermelon and a tool — I had a measuring spoon and Jasper had a melon-baller, and we sat for some time, each quietly spooning melon into a bowl. The quiet was largely due to the fact that Jasper was chewing. One ball for the bowl, one for him. Jasper using a Melon-Baller – excuse the iPhone video quality! Mashing, spooning, drinking. A delicious agua fresca. What are you exploring this summer? P.S. We spent our watermelon time indoors on a rainy day, but it would be way more fun with a backyard hose and picnic table, so I’m throwing it into my Backyard Montessori series. Our little family took a mini-vacation this weekend to a secluded island paradise (of the Canadian Great Lakes variety) and now that we’re home, we’re kicking back and relaxing with mornings at the coffee shop and afternoons in the backyard. It’s a good life. Our summer days are filled with relaxed sunny day activities, with lots of spilled water along the way. I’m kind of inspired by this hilarious post on how to give your kids a 1970s-esque summer experience, but I want to create an environment that helps to foster Jasper’s independence, creativity and concentration. 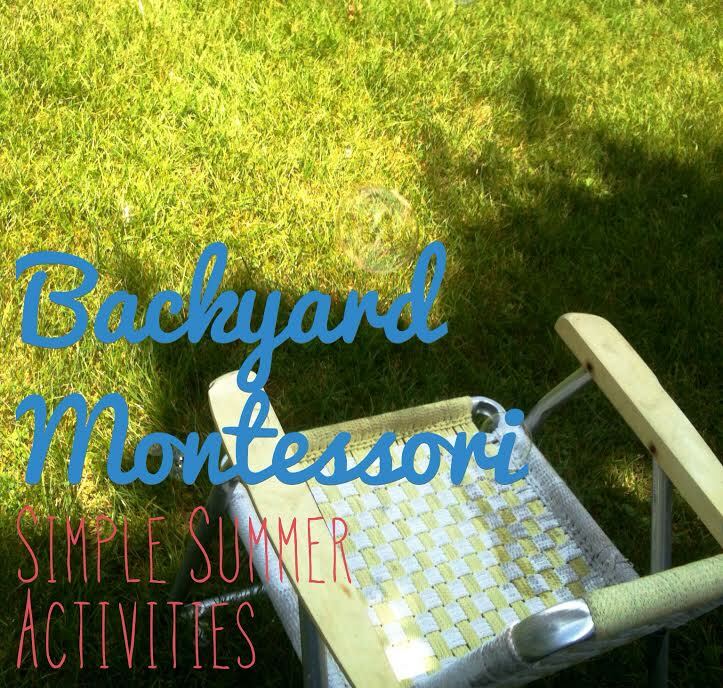 The Montessori twist on a lot of these backyard classics is to include the child in the process — every step of the way. Get things organized during nap time, but don’t finish the job. Gently stir all three ingredients, and leave them to rest in an open container overnight. These bubbles work so much better when given the time to sit after mixing the ingredients, so this may be the perfect opportunity to introduce some delayed gratification. If that’s not going to work, go ahead and make the bubble solution ahead of time. 2. Backyard car wash. There’s no reason to keep practical life activities indoors — get outside, pump some jams, and get the suds happening. We washed the Cozy Coupe (photo at the top of this post), but haul out the balance bike or the baby dolls, or whatever your child’s interested in. 3. Homemade popsicles. Jasper tasted his first popsicle earlier this summer and he didn’t mind a bit that it was only pure fruit, herbs and water, with no added sugar at all. 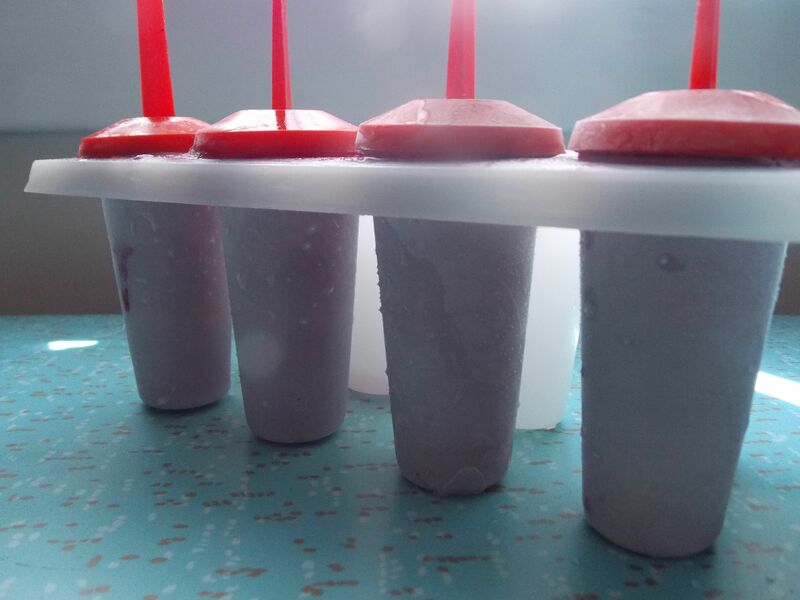 We’ve since made blueberry smoothie pops and I’m looking forward to tackling Selena’s toddler-made paleo pudding pops next. 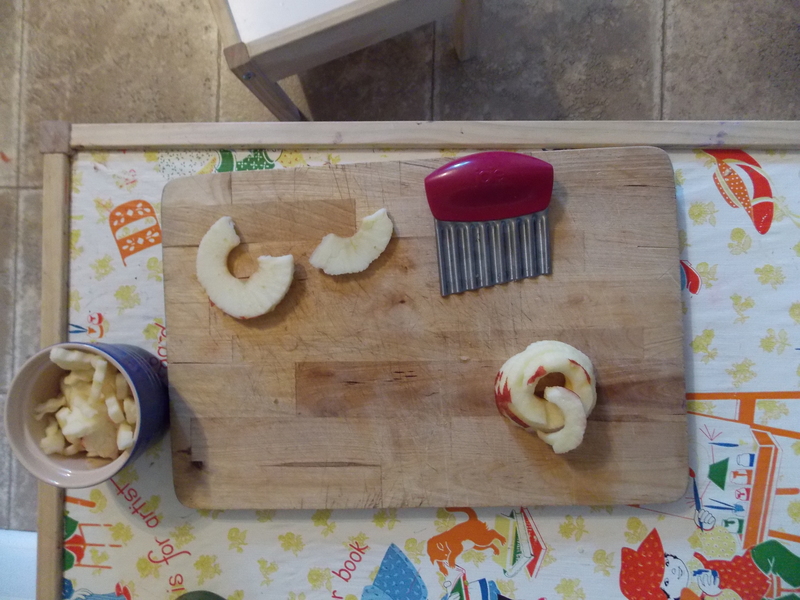 Toddlers can peel fruit, pour ingredients into a blender, and push the “blend” button. If you pour the blended ingredients into a smaller pitcher, your child can pour it into the mould too (well, they can aim in the general direction of the mould. Have some clean cloths on hand!). 4. Painting with water. 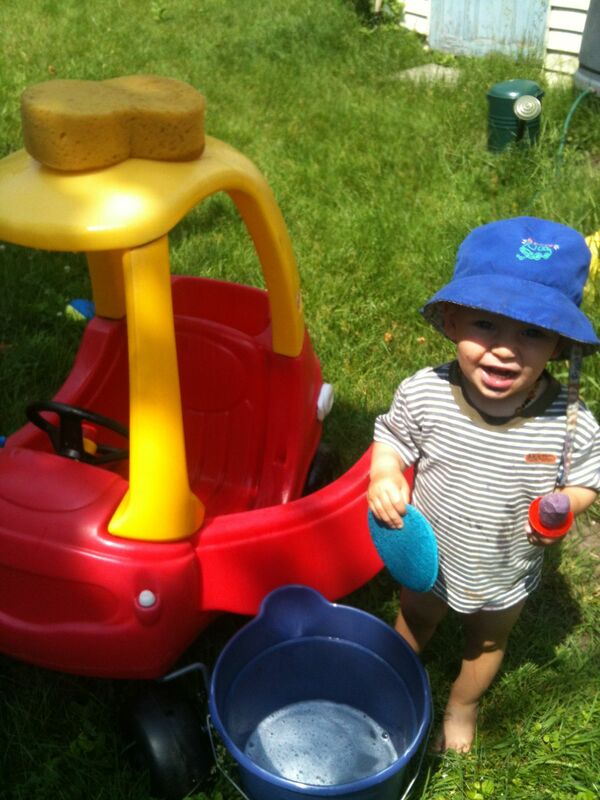 Summer is all about simplicity, and it doesn’t get simpler than this: a bucket, a paintbrush and water. I found this idea in Child’s Play by Maja Pitamic, a book full of fun ideas for toddlers. Paint the rocks, paint the tree trunk, paint the picnic table, and watch the colours change, watch the water evaporate. You really wouldn’t believe how much time Jasper can spend “painting” around the yard. This is a great work to have accessible and available on outdoor shelves. 5. Picnic. A classic. Get your toddler spreading that peanut butter, pouring that lemonade and packing up the dishes. It’s summer time, the sun is shining and it’s a Tuesday at lunch time. Isn’t that worth celebrating?